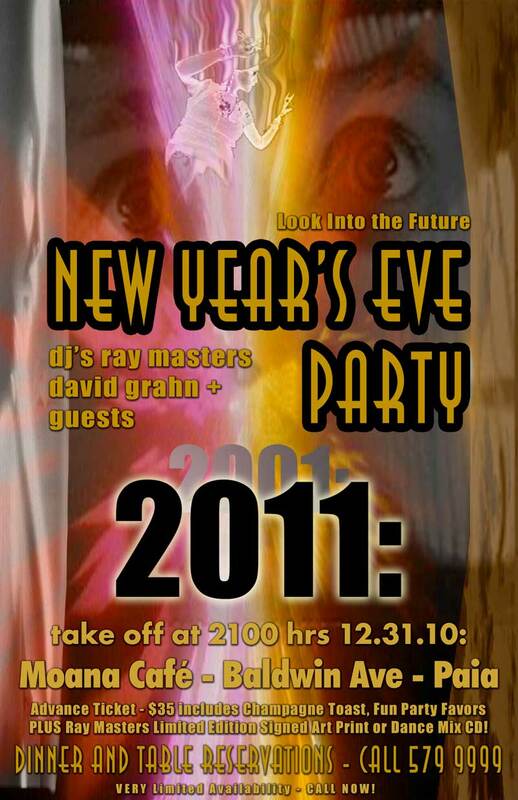 Please join us for our tenth New Year’s Eve Party on Maui, and our 21st Wedding Anniversary! If you’ve ever been to one of our famous NYE House Parties you know what to expect! Only one difference…it’s at Moana Cafe and we don’t have to clean up!!! This is sure to be a great night of wonderful music, food, drink and especially, good friends. And in our usual style we are pulling out all the stops to make this a party to remember. Imagine a Party 100 years in the Future and dress to impress! DJ’s Ray Masters and David Spruce will be spinning the very best House Music to keep you dancing through the night. Dave will be leaving us very soon so this could be your last chance to groove to his awesome music. He really is the best thing to hit our island in a long time. Do not miss him!!!! Advance door tickets are now on sale and very limited table reservations are available if you purchase one of our Platinum or Gold Tickets. TABLE RESERVATIONS ARE VERY LIMITED AND WILL SELL OUT IN THE NEXT FEW DAYS………BOOK NOW TO AVOID DISAPPOINTMENT. GENERAL ADMISSION IS ALSO LIMITED AND WE FULLY EXPECT TO SELL OUT BEFORE THE NIGHT….SO GET YOUR GROUP TOGETHER AND BOOK NOW!